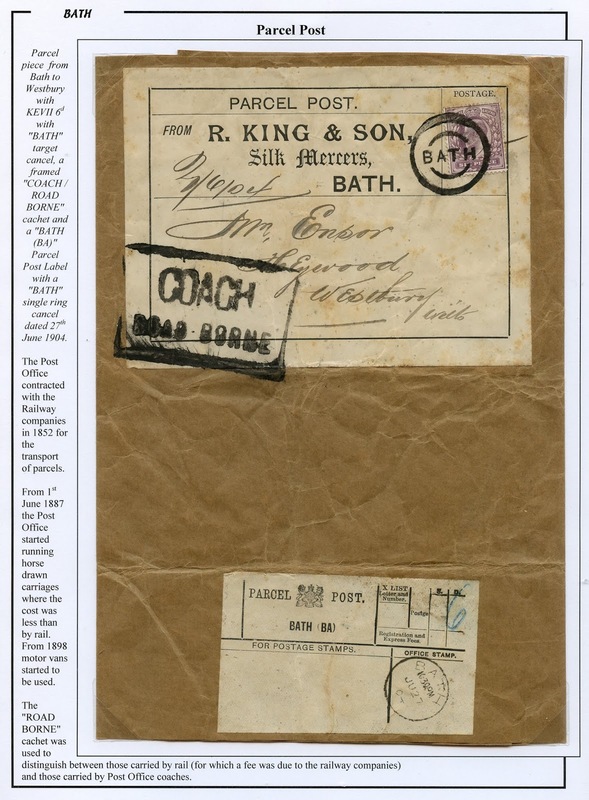 The item below is a piece from a parcel from Bath to Westbury in June 1904, with a "BATH" target cancel, a Parcel Post Label and a framed "COACH / ROAD BORNE" cachet. In 1852 the Post Office contracted with the railway companies for the transport of mail by rail. In 1887 the Post Office started running horse-drawn carriages where the cost was less than by rail (the first service was from London to Brighton). From 1898 motor vans started to be used. 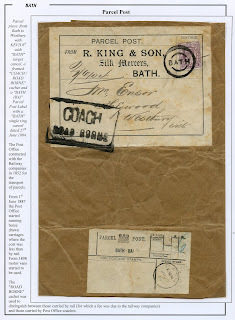 The "COACH / ROAD BORNE" cachet was used to distinguish between those parcels carried by rail (for which a fee was due to the rail companies) and those carried by Post Office coaches. Early Mileage Marks - "140 BRIDGE / WATER"
Early Mileage Marks - "113 BATH"